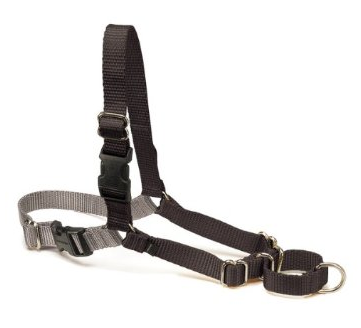 The next dog walking system I want to review is a current favorite among dog trainers: the front-clip harness. Like the traditional harness, the front-clip harness fits around the shoulders, front legs, and over the back of the dog. Unlike the traditional version however, the leash doesn’t attach above the dog’s shoulders, but instead under the neck, in front of and between the shoulders. Therefore also like the traditional harness, this version is comfortable for the dog to wear and is a matter of health and safety for dogs with a delicate or injured neck, back, or trachea – because again pressure is applied only to the strongest parts of the dog’s body. The front-clip harness was invented, however, to solve the major problem with the traditional harness – namely pulling on the leash. Back-clip harnesses don’t discourage, and even encourage pulling,a s they were designed primarily with sled dogs and tracking dogs in mind. But when a dog pulls on the front-clip harness, his front is pulled sideways, so he ends up pointing to the right or left instead of where he’s trying to go – straight ahead. This usually defeats the dog’s purpose for pulling, and he fairly quickly learns to stop trying. One of the most popular brands of front-clip harness, the E-Z Walk Harness from Premiere (pictured on the left), adds what’s called a “Martingale” loop to the front (on the right side in the pic). When a dog wearing the E-Z Walk pulls, this loop squeezes the dog’s shoulders together, adding a gentle deterrent to his pulling. In combination with the dog’s being turned sideways, this is often very effective. So the front-clip harness is a huge advance over the traditional one. If you’re going to use a harness, I advise a front-clip. Some owners swear by it, and some dogs are terrors on anything else. However, I still do not recommend it in general as a default means of walking. For apart from discouraging leash-pulling, the front-clip harness shares the other disadvantages of the traditional harness. First of all, it does not giving the owner an effective means of communicating to the dog by tugging or tapping on the leash. When a leash is connected to a dog’s neck, tugging or tapping instantly gets the dog’s attention and can snap his mind out of whatever else he is obsessed with or focused on – like an alluring chicken bone, or another dog. Since harnesses don’t touch any tender area like the neck, this tugging/tapping isn’t as effective. The front-clip version also shares the disadvantage of not controlling the dog’s head or mouth; so it shouldn’t be used for dogs that readily bite. Finally, E-Z Walks for some reason seem to slip loose, or the dog wriggles free, fairly frequently. I’m not sure why this is so, except that the traditional harness pulls back against the dog’s shoulders when he pulls, in a direction that can’t come loose; while the E-Z Walk pulls sideways, creating some gaps that can slip loose. 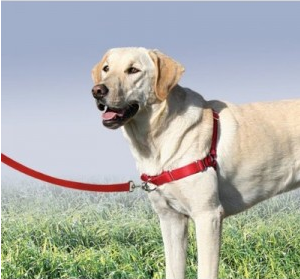 For this reason some owners of the E-Z Walk use it in combination with a neck-collar, clipping the leash BOTH to the harness front-clip AND the neck collar at the same time for security. This, however, is fairly restrictive and cumbersome. So here’s my recap of the front-clip (e.g. E-Z Walk) harness. Overview: A huge advancement over the traditional back-clip harness. Can help stop your dog from pulling on leash. However if your dog has any other behavioral issues – like jumping, barking, lunging, or biting – it won’t give you a means of controlling or correcting that behavior. Great for joyous, energetic pits or labs who pull and have NO other behavior problems – but many owners need more control over their dog in other areas.